Dave Obee with the WSGS Blog Team: Charles Hansen, Roxanne Lowe and Donna Potter-Phillips. 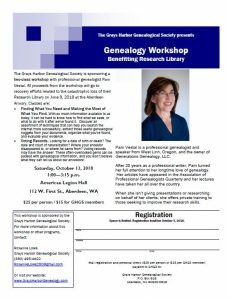 Despite a last minute venue change, the Eastern Washington Genealogical Society‘s annual Fall Seminar went off without a hitch — at least to the 70+ attendees. 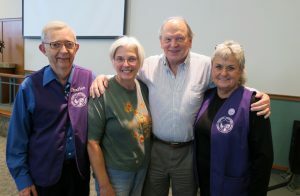 Leading Canadian genealogy expert Dave Obee delivered five presentations in an information-packed day. One of my favorite gems was my introduction to CanGenealogy.com — a Canada only version of Cyndi’s List. So many resources to investigate to learn more about my New Brunswicker great-grandparents! Organizers of the EWGS Fall Seminar should be very proud of themselves for pulling off this event. I felt so welcome — just like one of the group. If you’re looking for a well-done workshop, mark your calendar for Saturday, April 6, 2019. EWGS is hosting popular lecturer Sunny Jane Morton for their Spring Seminar. Donna Potter-Phillips (my gracious weekend hostess and fellow blogger) gave us a heads-up in this blog post. Lunch will be included for everyone who has registered. A mixed group of sandwiches has been ordered for you that registered afterr the October 15 cut off for the free lunch. So we all will receive “free lunch” for this event. 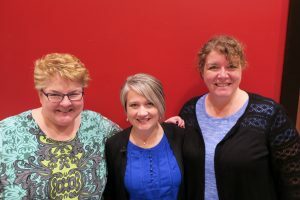 Genealogical research in the Pacific Northwest often leads to cross-border connections, because our relatives seemed to think that the grass was greener on the other side. Or maybe it was love, or economic opportunities. Presenter Dave Obee — a Canadian journalist and genealogical researcher, will give five presentations on researching your Canadian connections. Dave has written a dozen books and given more than 600 presentations at conferences and seminars in Canada, the United States and Australia since 1997. 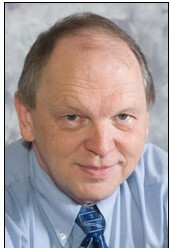 He is Editor-in-Chief and Publisher of the Times Colonist in Victoria, British Columbia. In 2012 Dave was awarded an honorary doctorate of laws by the University of Victoria for his work as a historian, genealogist and journalist. In 2017 Dave was awarded the annual Bill Good award, which recognizes a B.C. journalist, leader or educator who has made a significant impact in journalism and in the community at large. He is a member of the board of Canada’s History Society, and is a member of the services consultation committee at Library and Archives Canada in Ottawa. 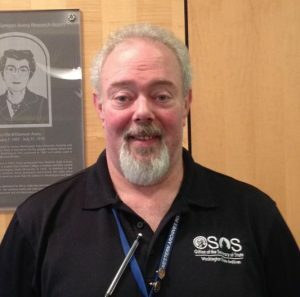 Dave is a columnist for two magazines, Internet Genealogy and Your Genealogy Today. He is the author of Counting Canada: A Genealogical Guide to the Canadian Census, and Destination Canada: A Genealogical Guide to Immigration Records. Dave is also the co-author (with Sherry Irvine) of Finding Your Canadian Ancestors: A Beginner’s Guide, published by Ancestry in 2007. Dave’s talk in Spokane will deal with immigration, the census, war records, Internet resources and more. While in Spokane Dave plans to do more research into his family connections here – connections that he will include in his talks. NO Lunch will be provided for REGISTRATION after October 15th. Sorry, NO REFUNDS! Free lunch is no longer included but registration fee is still required. You can register NOW online. Time is past for the free lunch menu but the registration fee is still required. This is a final reminder for our upcoming Fall Workshop a week from this Saturday. Our speaker that will be presenting Friday night and Saturday morning is well know for doing a number of webinars for Legacy. She is considered one of the premier speakers in the northwest. This is really one very big bargain for the price. You get the presentation at the library on Friday night and all day at Mt. Olive Lutheran Church on Saturday with presentations in the morning and classes in the afternoon. The cost of attending includes cake and punch on Friday night and lunch on Saturday. We have had to make one small change. Jim will be speaking on Revolutionary War Pensions instead of what was originally announced. Attached you will find an updated flyer and registration form if you have not had a chance to sign up yet. Friday evening session will be held at the YVGS Library. 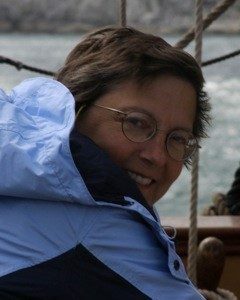 Speaker will be Mary Kircher Roddy on “Family Browse”. Saturday: Workshop will be held at Mt Olive Lutheran Church. What a day: DNA all day. 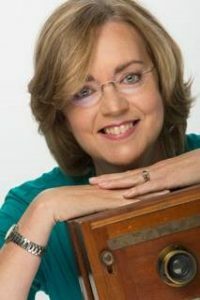 Spending the day listening to someone with a Bachelor’s Degree in Molecular Biology, a Master’s in Biotechnology and an alphabet soup of initials behind her name may not be everyone’s cup of cappuccino, but if that someone is professional genealogist Angie Bush, run, don’t walk, to sign up. And that’s just what over 135 enthusiasts (double the number from last year) did at the recent Heritage Quest Research Library’s Autumn Quest to listen to Angie’s DNA presentations. Held at the Emerald Queen Conference Center in Fife on Friday, 05 Oct 2018, Angie educated and entertained us on the science behind our DNA results, testing companies, “power tools,” and finding biological family histories for adoptees. She had just the right mix of technical information and storytelling. Heritage Quest Research Library is undergoing some major revitalization efforts (more on that next week). Judging by the success of the 2018 Autumn Quest, they’ll have lots of support and enthusiasm. Photo by Eric Timmons; published in The Vidette, Montesano. 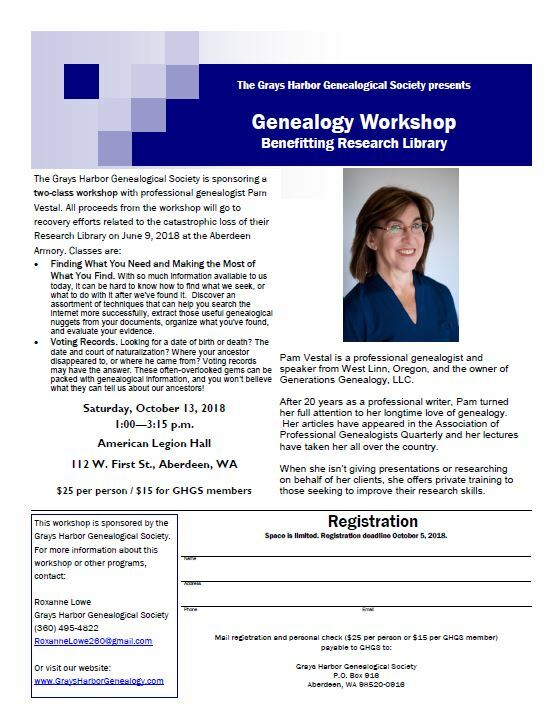 *** If you sign up in advance, you’re eligible to attend a FREE morning session (10:00) with Pam called “Beyond Obituaries: Discovering Your Ancestor’s Life in Records of Death.” Just send an email to Info@GraysHarborGenealogy.com. 9:00 am: The doors open. 9:30 am-10:30 am: Anthony (Tony) Birch is a retired higher education administrator and long standing member of Eastern Washington Genealogical Society. He doesn’t claim to be a heraldry expert, but a family historian trying to make sense out of things he has inherited or found through research. His presentation will focus on heraldry, and how the genealogist/family historian can use heraldry to learn more about their ancestors. 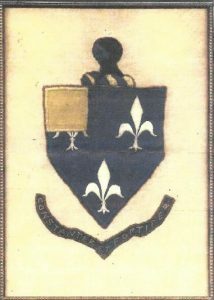 He will share examples of his ten-year search of his ancestors’ crests and coats of arms and what the many images, forms and colors mean. 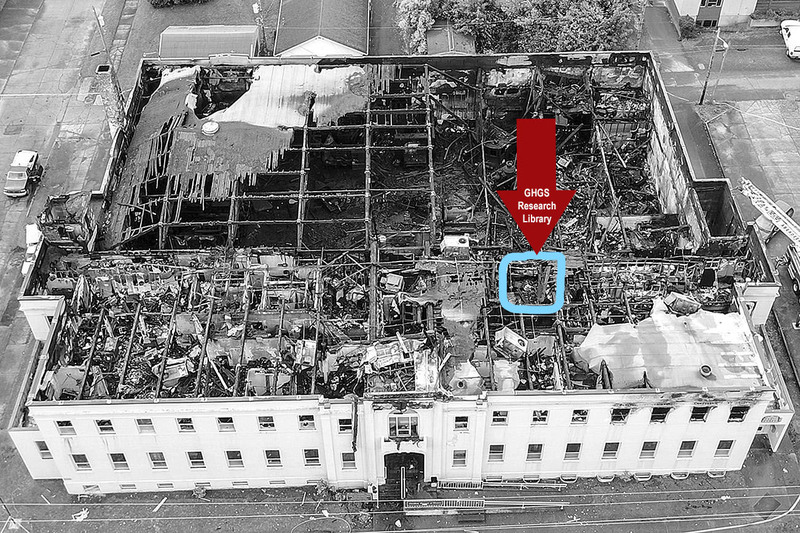 10:45 am-11:45 am: Lee Pierce is the archivist for the Eastern Region Branch of the Washington State Archives in Cheney, Washington. His mission is to collect, preserve and provide access to the records of local government agencies of the 11 furthest east counties of the state. He will be showing and telling about the digital archives and how best to use it, as well as other government resources that are available to researchers. by October 6 to accommodate handouts & refreshments. While the seminar is free, donations are welcome at the door. Directions: Turn off Bishop Boulevard onto Klemgard Ave., follow Klemgard Ave. up the hill and turn left at the top. Do not go into the front entrance, but turn right, continuing up the hill and turn left at the white car ports. Find an appropriate parking place, enter the building through the main doors and go straight ahead to the Social Room. 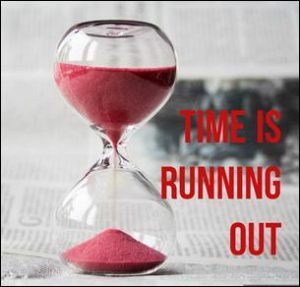 A reminder that registration closes at midnight on September 20th!! This promises to be our biggest conference ever and certainly is the largest genealogy conference in Western Canada. People are flocking from all four Western Provinces plus even Australia! If you are interested in Family History, don’t miss out. Besides having many interesting and informative sessions; a large Marketplace full of unique merchandise, information and piles of great used books; we are providing a FREE lunch and all-day refreshments! We also have over 100 Door Prizes including hotel packages, DNA Kits, Genealogy Software, Website Subscriptions and so much more! What’s not to love? You may even meet a distant cousin or finally make that big breakthrough on your elusive ancestor! Dave’s talks in Spokane will deal with immigration, the census, war records, Internet resources and more. While in Spokane Dave plans to do more research into his family connections here – connections that he will include in his talks. Lunch will be provided for PRE-REGISTERED guests. Sorry, NO REFUNDS! NOTE: Mail in Registration form will be soon be available. Please check back. You can register NOW online. Don’t forget to select your choice of sandwich when you register. Use the pull-down menu to select from a beef, ham or turkey sandwich.